Tired from her walk, Eva sat down on the stump of a tree to rest. Paul attached his prosthetic leg to his stump. The candidate is going on a stump through the Midwest to connect to more swing voters. That puzzle has really stumped me; I have no idea of the answer! The old lady stumped across the room. Stump comes from the Proto-Germanic root stamp-, and can be traced back to the Proto-Indo European root stebh-, meaning ‘post or stump’ as well as ‘to support.’ It is related to the Old Norse stumpr, the Old High German stumph, and the German stumpf (all meaning ‘stump,’) as well as the German Stummel (piece cut off). 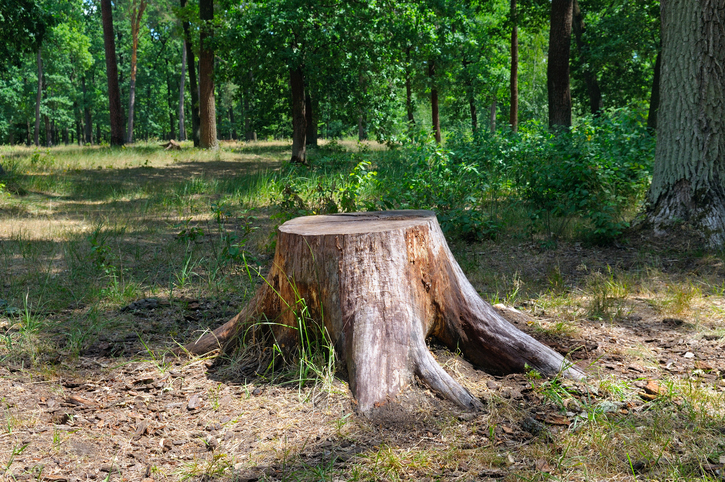 As a verb, stump dates back to the early 13th century, when the Middle English stompen or stumpen originally meant ‘to stumble over a tree-stump or another obstacle,’ though this meaning is no longer used. It came back in the late 16th century, meaning ‘to reduce to a stump,’ and ‘to walk around clumsily’ appeared around the year 1600. The figurative sense, meaning ‘to baffle or impede’ is from the early 19th century, and was first used in the US. The US political sense, to go on a speaking tour during a campaign, first appeared in the 1840s, and is derived from the notion of a stump speech, a speech given in a rural area, where sometimes large tree stumps were the perfect platform for the speaker. The noun dates back to the mid-14th century, meaning ‘the remaining part of a severed arm or leg.’ The meaning ‘part of a tree trunk left in the ground’ is from the mid-15th century. The noun has the same origin as the verb, but linguists do not think that it came from the verb. Rather, it has the same origin as the verb. This is because it is found as parts of surnames in texts from the early 13th century, even though the noun itself appeared a bit later.